Adrienne Imani editor-in-chief journeyonline@caaap.org Contributing Writer Abena Sharon Dale Contributing Photographers Abena Sharon, Adrienne Imani, Brenda Woods, Chandra Abernathy, Curtis 'Kojo' Morrow, Cynthia Anderson, Danielle Clark, Derick Triplett, Earl Gibson III, Floyd Carroll, James 'Jim' Morris, Larry Redmond, Levilyn Chriss, Matt Gibson, Michael Bracey, Sonja Hughes & Warren Hill Special thanks to all CAAAP members past, present and the future, keep capturing the memories Cover Photo by CAAAP Member Matt Gibson "From Wakanda with Love"
ABOUT CAAAP Our Goal Is To Support And Promote The Art And Science Of Photography In All Styles And Formats, As Individuals, As An Organization, And As Part Of The Community So That All May Enjoy And Benefit From The Images Of Our Lives. The mission of the Chicago Alliance of African-American Photographers is: To photographically document the culture, society, and history of African-Americans, its communities, residents and their ethnic exchange in the Greater Chicago area and throughout the world. To promote the work of professional and amateur photographers through sponsored exhibitions, publications, lectures and education in the field of photography, and its related genre. To Use our photographic images and expertise to inform the public and our community about the importance of photography as an informative and creative medium of expression. 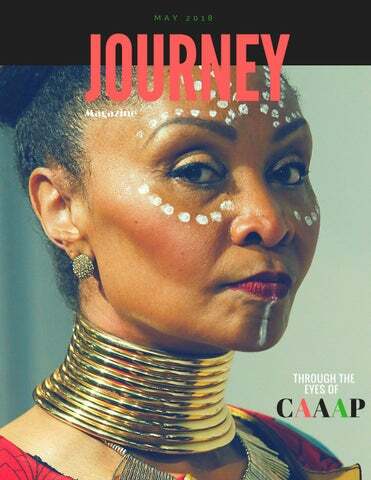 THE JOURNEY MAGAZINE COMMITTEE ADRIENNE IMANI-EDITOR IN CHIEF Thank you CAAAP for the opportunity of allowing me to organize and share the vision of this edition of the Journey Online Magazine. It's an honor to be able to share the works of so many awesome photographers and our stories with many people around the world. It is Through the Eyes of CAAAP that we're able to document the positive images in the black communities. So in this edition, we get a glimpse of how influential we are as black photographers. This is our story, this is our journey. I hope you enjoy and continue to support CAAAP. ABENA SHARON DALE-COMMITTEE MEMBER Welcome to the CAAAP Journey Online Magazine, where our aspiration is to combat the negative images that are constantly seen in mainstream media. We believe we are much more than the negative images portrayed on a daily basis and we want to highlight the everyday positive and special events within the African diaspora. My name is Earl Gibson III. I spent the better part of my life knowing that I wanted to be a photographer. I grew up in a family that loved music and, I found it captivating to watch the emoting that takes place as one attempts to convey their feelings in song. My job as a photographer is to share with you the emotions felt during the delivery and the stylization thatâ&#x20AC;&#x2122;s necessary to create the visuals along with the songs. I am a photographer for Getty Images and have been published works in Vogue, GQ, NYTimes, Essence and the Wall Street Journal. I am a native Chicagoan raised on the Southside of Chicago. I became a photographer to ensure that our stories were told by us. I hope that Iâ&#x20AC;&#x2122;ve done my job. Levilyn Chriss who is a member of Chicago Alliance of African American Photographers was born in New Orleans, raised in New York, and currently lives in Chicago. Levilyn started her studies at Kennedy King College where she received her Associate in Applied Science Degree in Media Communications. Kennedy King afforded her the opportunity to build a solid interest in video production, television production, and photography. Levilyn continued her education at Chicago State University where she obtained her Bachelors Degree in Communications, Media, Arts, and Theater. Ms. Chriss sought after higher education and received her Masters of Fine Arts Degree in Independent Film and Digital Imaging at Governors State University. Levilyn has since become a member of Reel Black Filmmakers and continues to practice her skills independently as a videographer and photographer. I captured images of Valerie Jarrett last year while she was interviewed by Starr Jones. Capturing images of her was of high importance because she's a strong positive example of a successful black woman that young women and girls can take lead from. I chose prom because it's such an exciting time for the students. It is like a right of passage for young adults to celebrate their next step in life and its such an exciting time for the students. It's a night of sheer elegance, fun laughter, adoring your classmates formal wear, or hairstyle...glam night at it's best! But mostly, it's a celebration of their hard work. The two young ladies below are completing their first year of college and I wish them a successful journey through life! From Wakanda with Love. Amidst all things Black in the month dedicated to our history, one MARVELous film stood out! Black Panther took the box office by storm grossing over 700 million in its first 3 weeks. Even greater than its impact in Hollywood is the impact it had through out the African American community. Bringing together families, bringing together communities, and bringing together a race of people that is constantly being torn apart. The strength of Black Panther the film surpasses the hero himself, in that it connects our past to our future, engaging us in everything the motherland should and could be. A delightful dose of Blackness in the month of Black History for all ages! Abena Sharon Dale Abena Sharon Dale developed a passion for photography at an early age. She graduated with a baccalaureate degree in Business Administration from Rosary College in River Forest, IL. Abena's artistic focus began as she studied photography at Chicago State University and has since explored and documented the beauty and interactions of the African experience. Her diverse photographic interests are documentary, photojournalism and events. She has been an active member of CAAAP since 2006. Abena is currently the CAAAP secretary and has served since 2007. It started in elementary school, my class had taken a field trip to Columbia College, and I remember saying when I grow up I want to be a photographer. In high school, I was enrolled in a Journalism, Television and Photography program, but by mid-freshman year my family relocated, and I transferred schools. Even though I transferred and the new school didn't have those programs, I continued to carry a camera to every event or family gathering as possible. Unfortunately, there was a period in my life that I no longer desired taking photos until college; after college, photography became a passion of mine again. It was then that I purchased my first professional camera and started to capture every object or person in sight. Today, I don't limit myself to what I shoot; I try to keep shooting. Photography is more than art to me; it is the way of life and therapy. LARRY REDMOND I like shooting political rallies. This particular rally was a May Day rally held on May 1, 2017, at Union Park in Chicago. I'm always struck by the range of people who come out with a range of movements to support. There is always such good camaraderie, such creative posters and such a spirit of indomitableness. Being an activist myself, I'm always inspired by the energy these rallies exude. I HAVE BEEN VERY BLESSED IN MY PHOTOGRAPHY CAREER TO REACH FOR GOALS AND ACCOMPLISH THEM. I STARTED BY WANTING TO PHOTOGRAPH EVERYTHING WITH MY CAMERA. I AM A SOCIAL BUTTERFLY AND LOVE MOVING AROUND TO CAPTURE THE RIGHT SHOTS. AFTER SOME TIME I BEGAN TO REALIZE THAT EVENTS AND CONCERT PHOTOGRAPHY IS WHERE MY PASSION LIES. I HAVE HAD THE OPPORTUNITY TO PHOTOGRAPH SOME AMAZING PEOPLE. MY INVOLVEMENT HAS BEEN IN MANY EVENTS FROM NYC FASHION WEEK, BLACK GIRLS ROCK, SOUL TRAIN AWARDS TO THE BET AWARDS JUST TO NAME A FEW. I LOVE CONNECTING AND NETWORKING WITH PEOPLE. .
My objective is to offer a photographic view of telling story using different techniques: Capturing different facial expressions such as the little boy wasn’t happy, when he was told to take a break from playing the bongos with his big brother; Camera angles of the two veterans saluting the honorary POW table; and finding images within one photograph such as the crowds are seen watching closely through the reflection in the male vocalist’s glasses. And, a story can be told without showing facial expression in the photograph by using objects & props drawing attention to the viewer’s eye. For instance, my photo of showing the bracelet promoting “Justice or Else” on the man’s wrist, while holding a jar of “I Am” bracelets in the other hand. My goal with the image was to show his mission for fighting for justice without showing facial expression and actions. I can’t recall when I began taking photos. I think somewhere around my mid 20’s. As a child I always enjoyed looking at the photo albums of my family and friends over and over again. My mother was my influence, she opened the door of photography for me. She always carried a camera. I began with a Brownie that my grandmother gave me. I used one of those awful Kodak cameras with the square bulb that never stayed put. Along the way my parents bought me my first REAL camera. It was a Canon. I hold a BA from Columbia College in Liberal Arts with a minor in photography. I have a MAS degree in Media Communications from Governors State University. I love to shoot everything! Of course primarily, in Black and White. I seek anything from events of any sort to birthday parties and from musical venues to civil unrest. I am an artist with a multitude of talents, yet a master at none. I consider myself to be a diamond in the rough. I really don’t know the true definition of a professional photographer. My vision of self is that of a documentarian. That’s what I strive to do through my photography. I just want the imagery to tell a story and I want the viewer to get it. The first 3 images are from the Black Lives Matter Rally. I was really impressed with the young girl. Owning up to her responsibility not only as a representation for equal rights for her race but as a female. The gentleman holding the flag led me to believe that he had been down this road many times. Yet in he reminds me of my mother's matra. "Keep on Keepin on". The No Violence photo really struck me because the group exhibited just what the message read. A diverse populus conversing and getting along. The Image of the three boys are my Nephews taken many, many years ago. I thought it was fitting to present the image in the wake of all that is happening. To show how unfortunately, over thirty years later still no justice and no peace. For me the sky image represents a breakthrough. All the images are strung together and enveloped with a symbol of shining hope. I have been a member of the Chicago Alliance of African American Photographers since 1999. During that time, I have served as vice president, President, and as a member of the Board of Directors. Photographically, The Chicago Community Trust, Seaway Bank & Trust, and Hull House have displayed my images in their publications and my work has been represented by Flat File Gallery of Chicago. Capturing images during and after winter snow storms is a challenge I enjoy. During the predawn hours of an extremely cold morning in 2002, I made my first attempt to photograph a snow laden Chicago from a small bridge on Fullerton Avenue. In the accompanying images, that photographic experience has been merged with CAAAP's photo journalistic focus . With age, the challenge of photography in the snow has increased for me, but it continues to captivate my interest. If you enjoy a challenge, I encourage you to pick up your camera and go out into the snow. CynthiaÂ Anderson Just outside of the United States, you will find a place with strong culture, traditions, expressions, a love for Michael Jordan and the primary language is Spanish. That place is Havana Cuba. During my visit, I found women sitting in a public square waiting to tell the fortune of someone in a place frequently visited by tourist. Havana is known for their cigars and the dapper fully beard gentleman is about to enjoy a very large one on a boulevard. If large cigars are not for you, the gentleman sitting on the steps of a boulevard is willing to sell smaller ones. On Artist Row, you will see a woman creating a garment using needle point. She, along with other artist were selling unique items ranging from hand puppets to paintings. Going off the tourist trail, a gentleman is proudly wearing a black and red outfit as he gazed above his shades. The legacy continues Morehouse 2030. This photo was taken in the Martin Luther King Chapel on the campus of Morehouse College. The young man reading the quotes of Dr. King will be a member of the class of 2030. The Flags at Fort Negley. I captured this photo as I was driving through Nashville, TN. August 13-December 7, 2017 marked the 155th Anniversary of the construction of Fort Negley. The flags represent the 2771 African American Men, Women and Children who built the Federal Fortification in Nashville, TN. At least 600 workers died during the construction of the Fort. On his return to America, he attended the American Academy of Art in Chicago from 1957 to 1959. He later studied under Professor Augusta Nall, an instructor at the Washington Park Community Center.. Morrow was grateful that he was chosen as his understudy. He credits Professor Nall with not only teaching the fundamental of art but how to live and think like an artist. After 4 years under the tutelage of Gus Nall, Morrow relocated to New York to develop his own style. While there (1962 to 1965) he became disillusioned with the social and political situation. It was during the this time, Morrow decided to relocate to Ghana, West Africa. He lived in Ghana for eleven (11) years, 1965 to 1976. After being adopted and renamed, (Kojo-Achampong) by an Ashanti Paramount Chief, Nana Kwaku Duah. Mr. Morrow was introduced to the art of jewelry making by carving traditional jewelry from cow-horns and ivory. Learning this trade not only enabled him to earn a living but also to employ several Ghanaians who in turn taught him their traditional customs and languages. On his return to America in 1976, Mr. Morrow aka â&#x20AC;&#x153;Kojo,â&#x20AC;? applied his carving skill into wax-carving of jewelry designs, known as; jewelry model-making and lost wax casting. "After 35 years of jewelry designing and lost-wax casting, I have returned to my first love of oil painting and photography.. Now in my 80's I plan to spend the remaining of my years, cataloging my works and creating more. MY LATEST: I've spend the last 3 years documenting my art works via memoirs and picture books as my art progressed. Fortunately I've survived to the internet age. Had I not documented my art works my creations would've been lost to history like many artists, not easily visible except for those in collectors private homes." "The Artist's Odyssey"